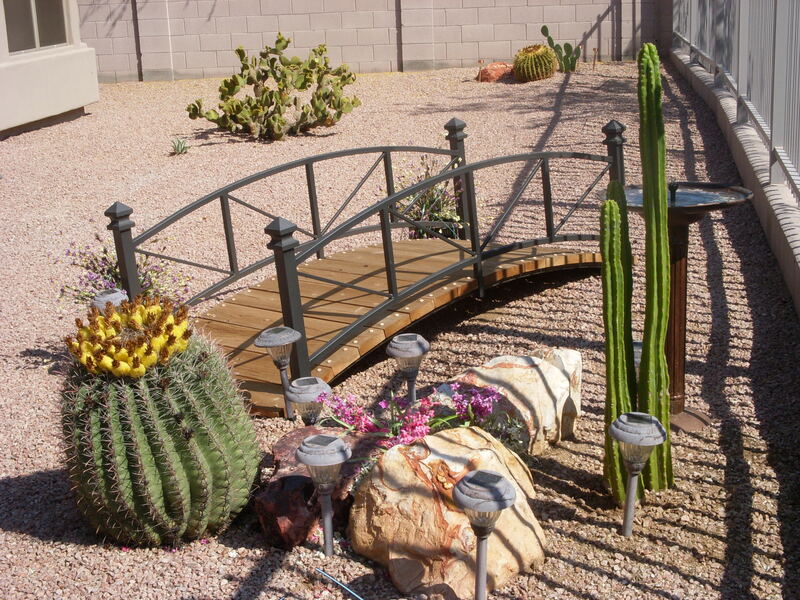 Cliff’s brother’s backyard in Phoenix whom we visited on our round-the world-road-trip. The two brothers grew up in Baltimore and spent summers at Ocean City, Maryland. Ken said this is his boardwalk. I liked all the shadow lines in the shot. That’s the ocean next to the boardwalk, silly. Funny photo–especially with the shadows. Looks HOT, HOT, HOT! Makes me thirsty. I’d love to see it at night, also. Reminds me that what I love about the beach is the WATER! agreed – and the weather was even nice while we were there. But I love the shadows and the splashes of colors. YOu have to look for it, but there’s water – in the little solar fountain behind the green tall cactus and next to the bridge! Having been born and raised on Long Island, NY and then spending the second half of my life in the Midwest, I speak with authority to say…. anything with sand and spiky vegetation is not a beach. It’s more like a little piece of Haedes, to this landlubber! but then you gotta appreciate his wacked sense of humor!